A woman was arrested Thursday after a fiery crash shut down a portion of the Pacific Coast Highway and left three dead and one injured, according to authorities. A northbound white Hyundai Sonata crashed into a red Toyota stopped at the intersection of PCH and Magnolia Street early Thursday, Huntington Beach police said. 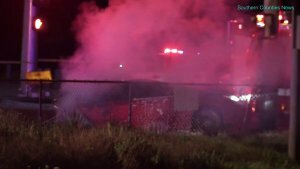 Crews, who responded shortly after 1 a.m., discovered one of the vehicles on fire and extinguished it. At least one person died at the scene and another was transported to a trauma center, according to police. Officer Angela Bennett later said that three individuals died from the crash. A female driver, 27, was arrested on suspicion of DUI and transported to the Huntington Beach Jail, authorities said. Officials closed all lanes of the PCH between Brookhurst and Newland streets. Bennett said the highway reopened at around 8:30 a.m. Anyone with information can call Huntington Beach police accident investigator Joshua Page at 714-536-5670.